Fun episode, Garibaldi going into down below was great. Moves the Clark/Santago story foreward. I give it a "Good". Agreed. Plus, I loved the bit about the doctor being aboard Kosh's ship and that Earth guy wants to board/search it. I'd like to see him try. Plus it makes a great avatar. B+ in my book. Not supreme quality, but a darn good ep. 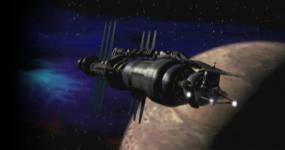 I also would love to see the EarthForce guy try to search Kosh's ship, and Garibaldi getting tough is fun to watch. Although what's with him and getting stabbed? About as bad as Sheridan's forehead for attracting minor injuries. I thought it was a very clever episode, with humor just where it belonged, and a nice way to push the idea forward that the Vorlons manipulate oganisms to suit their needs. So I gave it the only "A". I gave it a B rating more to move along the Clark story line and the building suspicions regarding Santiago's death wasn;t an accident. I was hoping somebody would notice! I'll for for the A here too. It's not the best of the best but overall a very good episode. Maybe a B+ would be more appropriate but because this one has it all I'm moving it up to the A range. Well, the fact that I watched that episode recently went a long way toward reminding me.